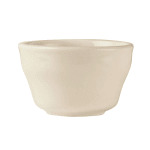 The World Tableware PWC-4 Princess White bouillon cup is made of durable and lightweight stoneware for high-volume use. A rolled edge around the rim adds chip resistance, and the cream white color blends into a variety of settings. A polished foot keeps the bottom from marking tabletops. This World Tableware PWC-4 Princess White bouillon cup has a 71⁄4-ounce capacity, making it perfect for serving chili, soup, and other dishes.